Did you know horned lizards can squirt blood from its eyes? One Las Vegas street art mural from the Life is Beautiful festival shows us what that looks like up close—or rather, really largely. Belgian artist ROA, in association with JustKids, has blessed DTLV with another Downtown Las Vegas hot spot. ROA has a particular monochromatic style. His pieces are black and white with one added color for contrast. In the horned lizard mural, both the eyes and the blood stand out: the eyes are yellow and the blood is crimson red. Earlier pieces of his implement physical objects like domes, along with a yellow eye on an octopus and yellow yolk of an egg. ROA is certainly a favorite artist in the street art community, often drawing attention to the more bleak aspects of life. Especially with the Horned Lizard, the morbidity stands out. Because we couldn’t have just a giant lizard mural, it had to be squirting blood from its eyes—and we wouldn’t want it any other way. What makes this Las Vegas street art so perfect is that the horned lizard is a native Mojave desert animal, making it a native Las Vegan. If not for the miserable summers and intense dust storms, we’d forget we’re in the heart of one of the largest deserts on Earth. Life is Beautiful brings Las Vegas street art that speaks directly to residents of Las Vegas. 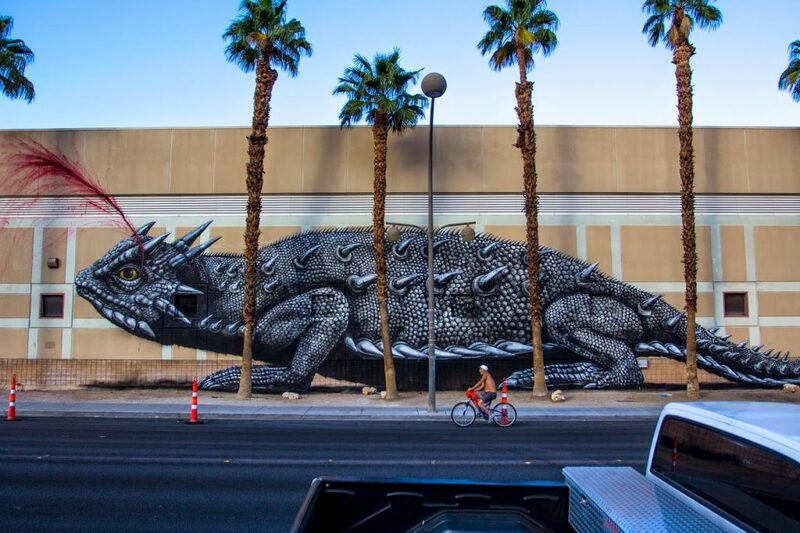 Whether it be a victory salute to a city fully recovered from a time where it was run by the mob, to famous figures who have left a permanent and legendary imprint on our culture, Las Vegas shines even brighter every time an artist like ROA paints the walls of our great city. The Vegas Pub Crawler takes place right here in the Downtown Las Vegas arts district where you can see a ton of awesome Las Vegas attractions. Come see for yourself what artists have brought to the Las Vegas street art community and have yourself several drinks along the way.